Just east of Grand Terre, and running parallel with it, lie Loyalty Islands. Consisting of Ouvéa, Lifou, Maré, and a number of smaller islands nearby, the archipelago features unique attractions on each of the main islands. At Ouvéa the pristine white beach stretches as far as the eye can see--28 km (17.4 mi) in total--gently lapped by the waves of the turquoise lagoon. Lifou rises out of the water on sheer cliffs, hiding secret caves, secluded beaches, and coral reefs. Meanwhile, mysterious pools and pits plunge into Maré's fossil coral rock, and caves honeycomb the island. Sparsely populated, Loyalty Islands have nevertheless incorporated many modern conveniences into the traditional lifestyle here, including an ATM at the bank on each island. You do have to reserve any catered meals 24 hours in advance, but the local crab or lobster platters are well worth the effort. Loyalty Islands is in New Caledonia. 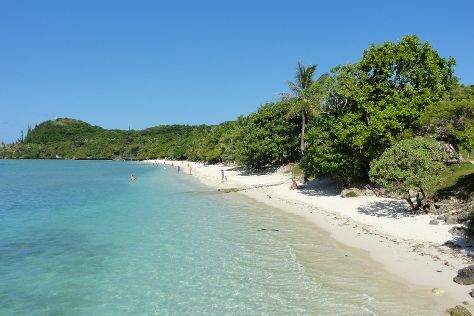 Ask Inspirock to suggest an itinerary and make planning a trip to New Caledonia fast, fun, and easy. For the most authentic Loyalty Islands experience, stay at one of many gîtes (private bungalows or guesthouses) run by local tribes and dotted around the archipelago. Most gîtes offer a camping option and will provide a hot meal (usually delicious seafood) if you notify in advance. Beyond that, a handful of hotels spread across the three main islands, featuring a slightly fuller service. On the smallest islands, where standard accommodations aren't available, lodging with a local tribe can sometimes be arranged through the tourist office in Lifou.